Braveland, a window gallery installation by Magda Wojtyra and Marc Ngui. 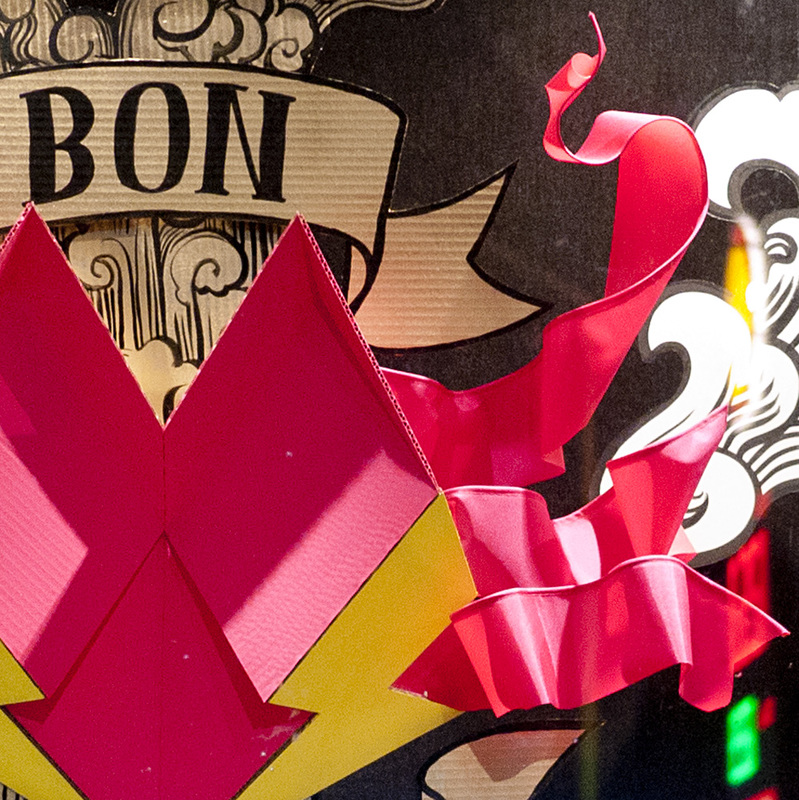 Cardboard, card, acrylic gouache, textile, wire, gold spray paint, 125″ x 72″ x 40″. At Fine & Dandy till 30 June 2012 and visible 24/7 from the street. 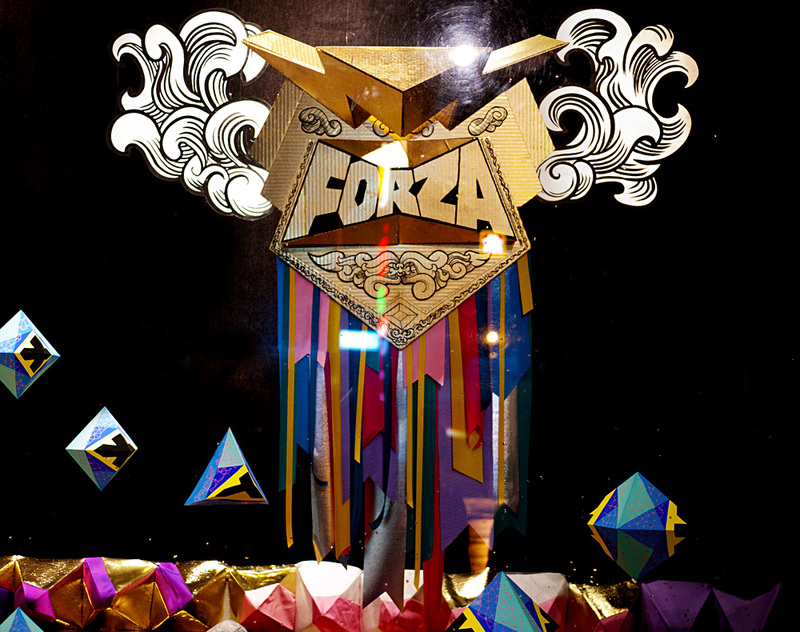 Braveland presents a pair of giant medals made of brightly painted cardboard and textiles and emblazoned with the phrases “Forza” and “Bon Courage”. Set in a fantastical, geometric landscape, the medals celebrate the viewer’s many daily acts of courage. 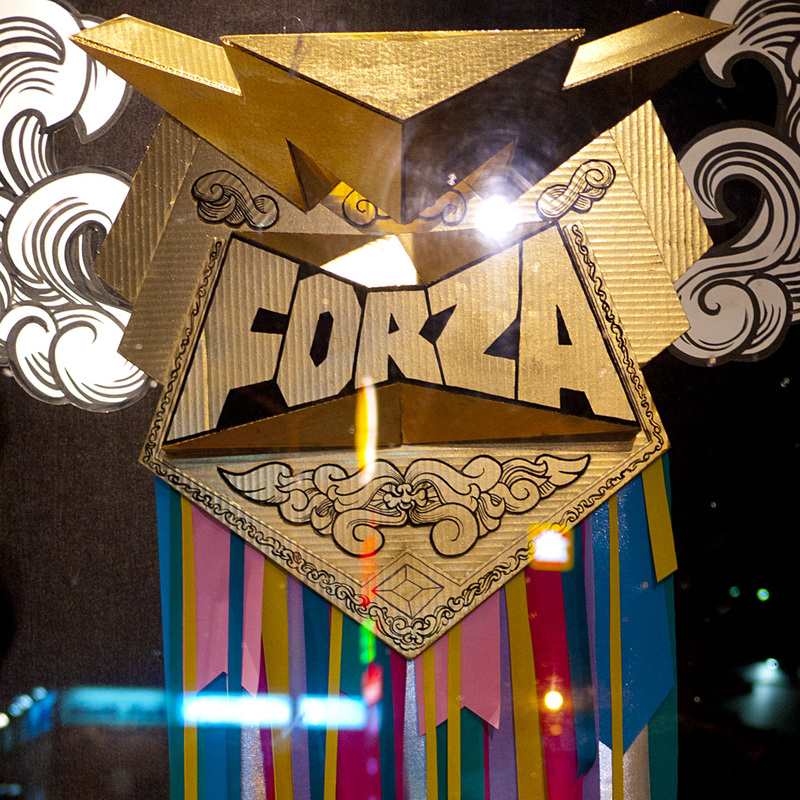 “Forza” means force or strength in Italian. It is used much like the English phrases “take heart”, “be brave”, “good luck”, or “break a leg”. Forza derives ultimately from the Sanskrit “barhayati”, meaning to both pluck up or tear away as well as to invigorate. “Barhayati” is the causative of “brh”, which itself can mean any of to grow strong and thick, to uproot, and to bellow like an elephant. 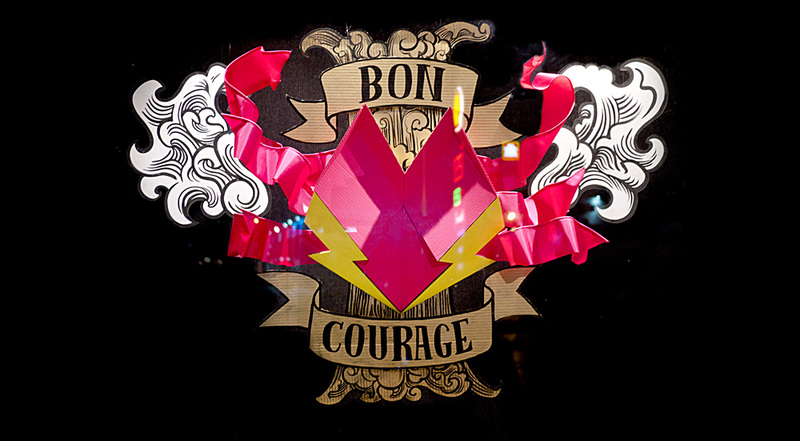 The French phrase “Bon Courage” means “be brave” as well as “good luck”. The word courage is derived from the French “court” which means heart and points to the emotional nature of this aspect of our being. The fancy chivalry style of Braveland and the humble materials of painted cardboard bring attention to the bravado aspect of bravery. We dare in spite of risk and with no promise of success, for if one felt no fear, bravery would not be required. Courage is needed and shown in embracing true novelty outside our comfort zone, willingly taking on tasks that push our skills to the limit, and facing adventures and tribulations that test our resolve to keep growing and evolving. We can become more brave by simply recognizing our small and daily acts of courage because the metaphoric heart, much like its muscle namesake, does grow stronger with exercise. This is good news whether making healthy changes in our daily routine or facing life changing decisions. One could say that it is the conscious summoning of courage that is its essence. And this can sometimes be so difficult that it deserves a medal. The medals of Braveland are dedicated to the viewer, with the wish that Forza! Bon Courage! and similar expressions take root in our language and experience, and also that as our hearts grow stronger they yet remain gentle. 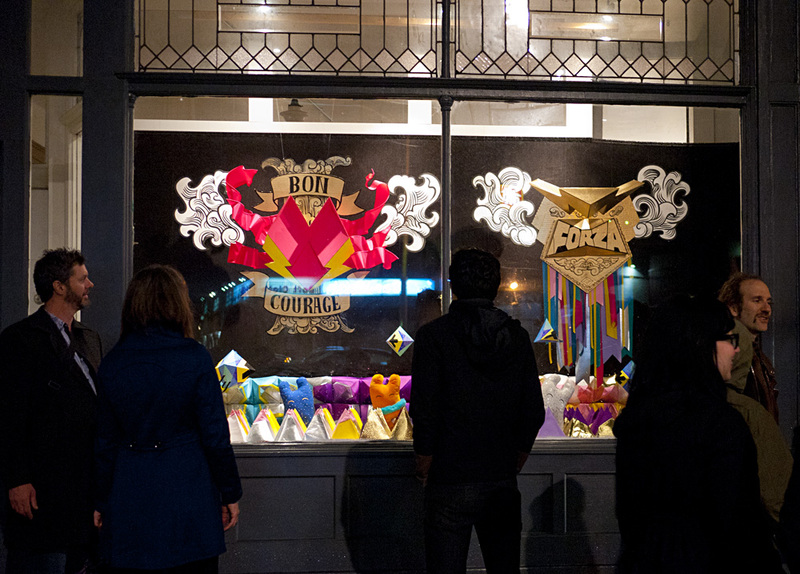 Photo from the opening of BRAVELAND, a window installation on 1 to 30 June 2012 at Fine & Dandy. A rainy day reception was held at Cafe Pho Nho, followed by a casual walking tour led by the artists, first to WNDW 3, “New Crust” by Eunice Luk at Howard Park Institute, and then to WNDW 2, “Braveland” as both windows are within two blocks of each other. 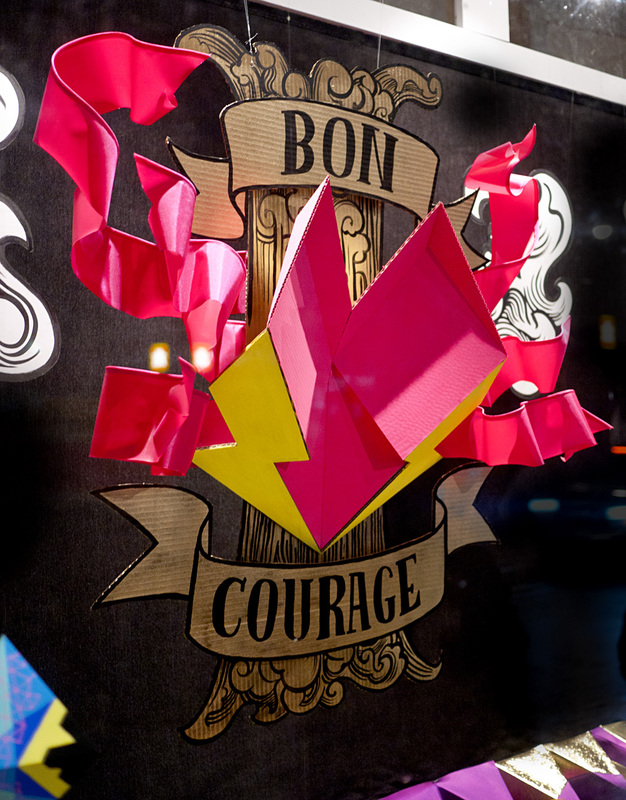 Bon Courage Cardboard, acrylic gouache, textile, wire, and gold spray paint, 3′ x ‘4 ‘ x1’, 2012. 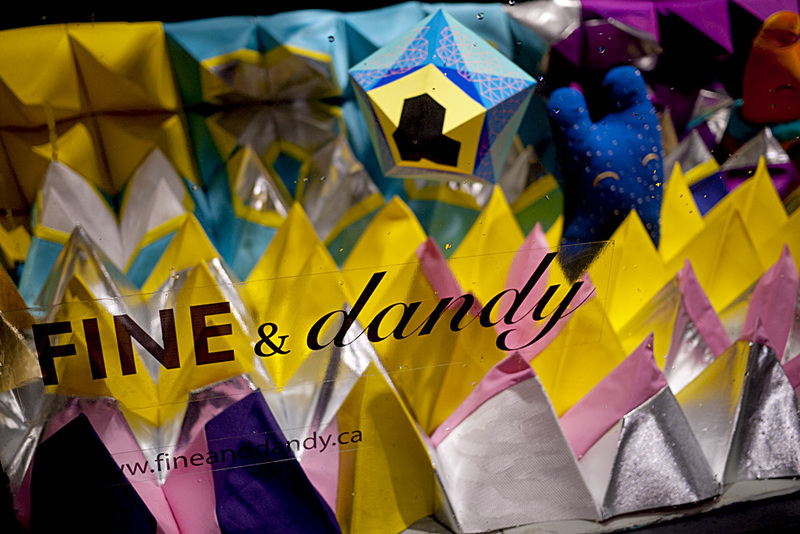 Fine & Dandy sign on the glass of the window gallery in front of the Polytopia textile mountails and a floating Geom, made of card and acrylic gouache. Drops of rain sit on the glass, and a blue beaded Happy Sleepy sits in the background. WNDW is a multi-site project that links 5 Toronto window galleries. An opening reception for this multi-site project and for Larry Eisenstein‘s window piece at Gallery 1313. A picnic in Hillcrest Park directly across from the venue — featuring a brief in character performance by The Canadian Romantic! A celebration of Magda Trzaski‘s new work at Dufflet Pastries – right beside the *Queenspecific window. The Carousel Exhibition Series presents occasional gallery shows that bring together groups of artists who have, through their practice and aesthetic, strongly connected to the community developing around CAROUSEL magazine. By flipping the concept of the art gallery inside-out, window galleries expose people of all ages, backgrounds and histories to a diverse selection of work utilizing a wide range of media. They allow the public to experience contemporary, experimental art comfortably and conveniently. The preconceptions of art gallery etiquette and protocol become non-issues at street level. There’s no threshold to cross. There’s no dress code in effect. The intimidation and boundaries of a traditional gallery disappear. Only the art remains. WNDW is a multi-site project that links a cross-section of Toronto’s independent street-level window galleries for the first time, exploring how vacant windows in downtown cores are being transformed into unquestionably accessible, 24-hour walk-by galleries.